Karatepa– religious centre, from Uzbek means “black hill”, situated in the north-west corner of the ancient city Termez, its square is 7 hectares. The centre consists of temples and monasteries, which were built at the beginning of the II century BC. The main feature of these complexes is the combination of cave structures and land structures from clay and dry grass, and also of bricks. 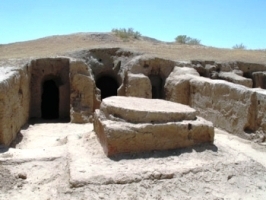 Buddhist center Karatepa consisted of ground-cave (western and southern peaks Karatepa) and ground (northern peak) structures. According to the archeological researches, there was the second floor (there was found stairs). Limestone and carved ganj were used in architectural decoration. Interior of Karatepa was decorated with ornamental painting on plaster and sculptures of clay. The greatest prosperity the cult centre Karatepa received in II-III centuries, but in the IV-V centuries most of the complex stopped functioning. There are many pictures and inscriptions on the wall of the temple (in in the Bactrian, Middle Persian, Sogdian, Syriac and Arabic languages). Sculptures of Budda and people are made from clay, sometimes from limestone. As Termez situated in convenient geographical position, it was attacked by rulers of many states. Despite Termez again revived and regained its former glory.